The maximum temperature on Thursday was 37ºC (98.6ºF) and the minimum 28.8ºC (83.8ºF). The maximum relative humidity was 72 per cent and the minimum 44 per cent. Rainfall: Rain or thundershowers have occurred at many places in east Rajasthan, at a few places in Himachal Pradesh, Jammu and Kashmir and east Uttar Pradesh and at isolated places in Punjab, west Uttar Pradesh and Uttaranchal. Weather was dry in the rest of the region. The chief amounts of rainfall in cm are: Himachal Pradesh: Bangana 3 and Berthin, Kahu and Solang Nullah 1 each; Jammu and Kashmir: Katra 4 and Pahalgam 3, Rajasthan: Pilani 3, Jhawaharsagar 2 and Asnawar, Banera, Bizlita, Guddadam, Mandal and Kota 1 each; Uttar Pradesh: Fetehgarh 9, Mohana 6, Regoli 4, Dabri and Mirzapur 3 each, Auraiya, Basti, Etawah and Mukhlispur 2 each and Gorakhpur, Gonda and Katerniaghat 1 each; and Uttaranchal: Joshimath and Uttarkashi 1 each. 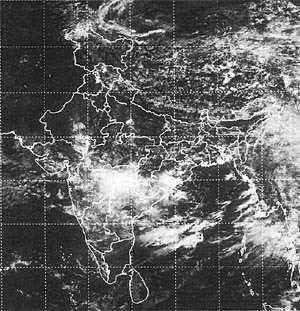 Forecast valid until the morning of July 20: Rain or thundershowers will occur at many places in Himachal Pradesh and east Uttar Pradesh, at a few places in Jammu and Kashmir, east Rajasthan, west Uttar Pradesh and Uttaranchal and at isolated places in the rest of the region. Forecast for Delhi and neighbourhood valid until the morning of July 20: Partly cloudy sky with possibility of light rain/thundershowers in some areas.